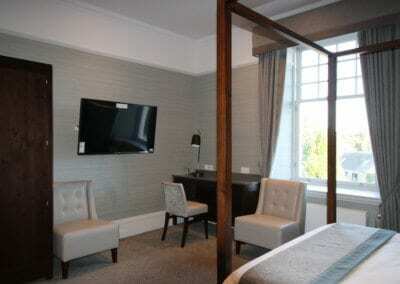 CASTLECARY HOUSE HOTEL REFURBISHMENT, CUMBERNAULD, GLASGOW. 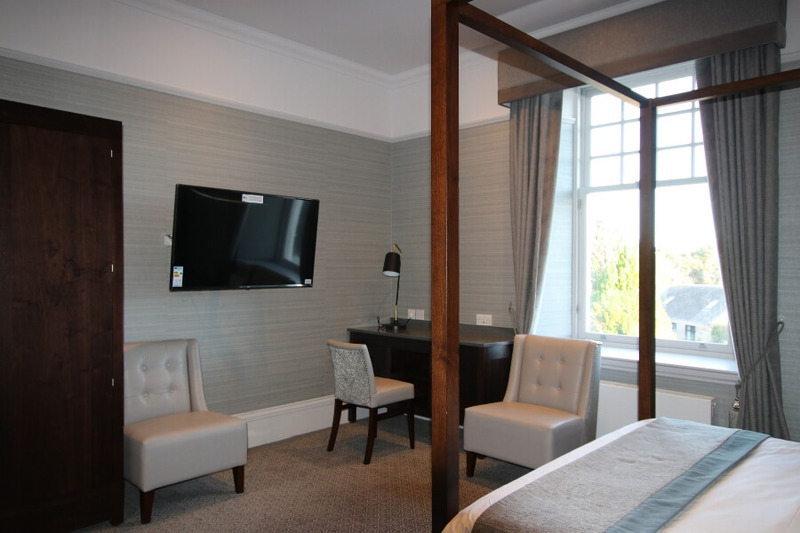 Allstar Joinery, Main Contractor – Phase One, First Floor Hotel Refurbishment. Allstar Joinery carried out all multi trade works including all joinery works with our own dedicated inhouse team. 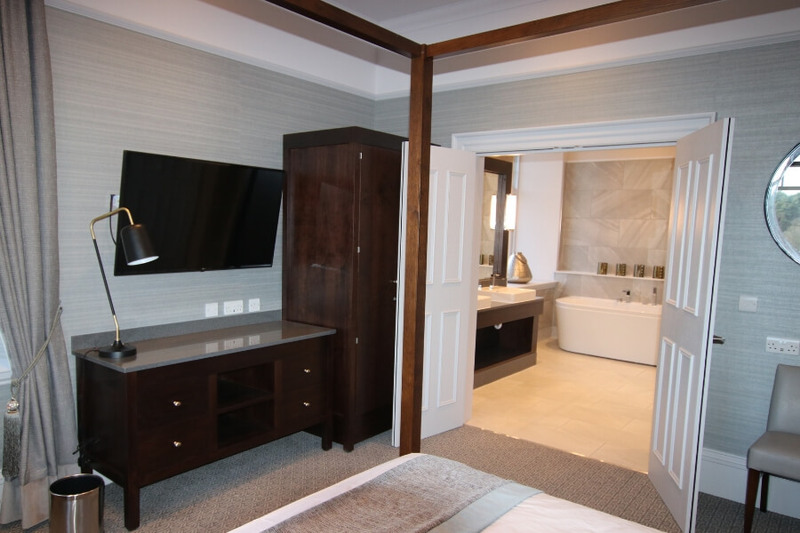 Allstar Joinery also supplied and installed all the manufactured bespoke bedroom furniture from our own Sustainable Production Facility. 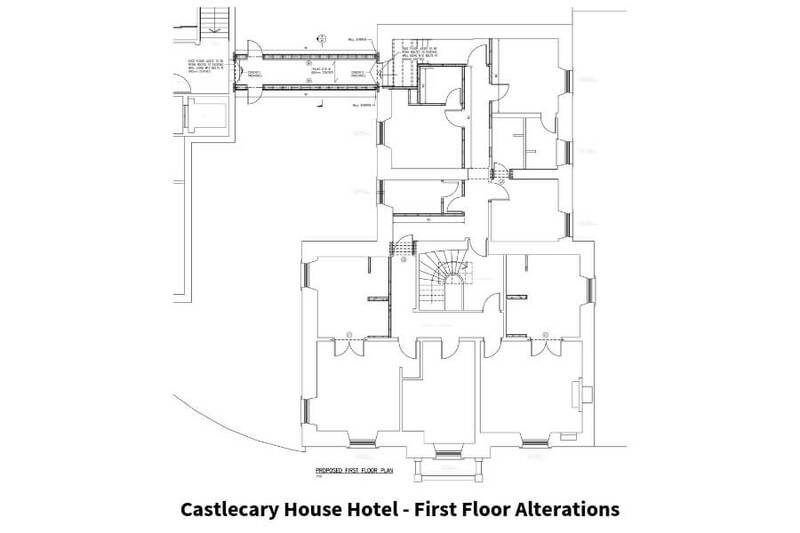 Allstar Joinery was appointed as the main contractor by the owner of the Castlecary House Hotel as well as bespoke commercial joinery manufacturer. 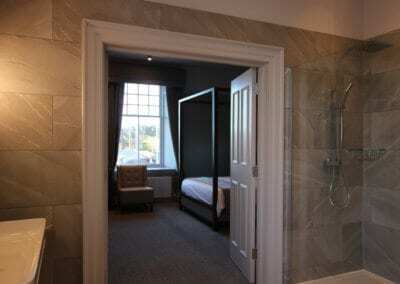 The Castlecary House Hotel is at Castlecary Road in Castlecary, Cumbernauld, near Glasgow, Scotland. 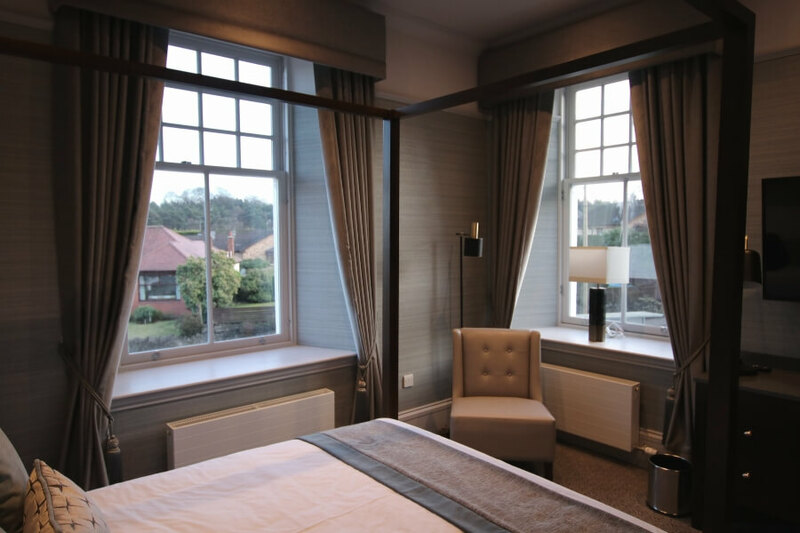 The Hotel comprises of a Victorian main house with a contemporary extension to the rear which has bedrooms on the first floor and a bar on the lower floor. 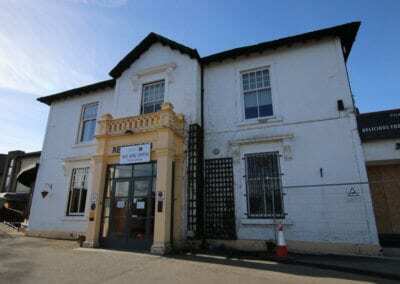 It also has a flat roof ground floor extension which is now a restaurant. A more modern wing comprising of a reception area, toilets and function room with bedrooms above was built around the year 2000. 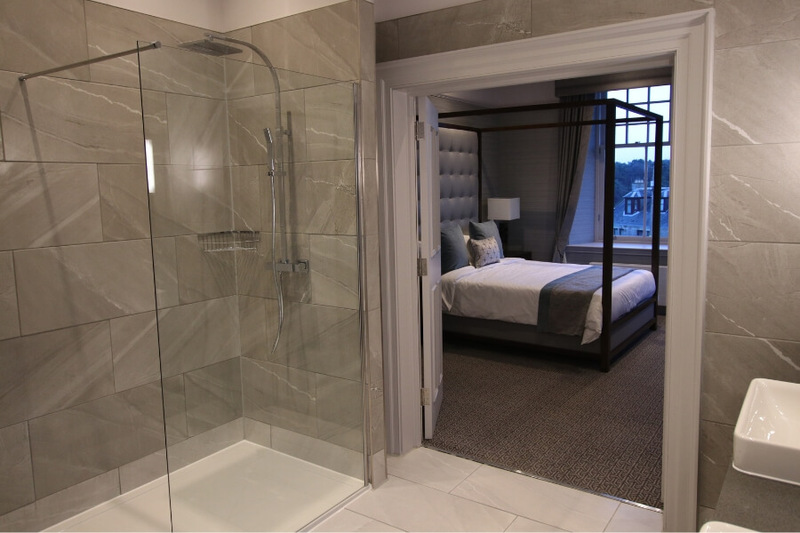 The proposal was to upgrade the first floor fire escape provision, re-organise bedrooms, provide major hotel bedroom refurbishment to each room with en suite bathrooms and to create two bridal suites with en suite bathrooms as well as the manufacture of bespoke hotel bedroom furniture. The existing single fire escape and only access to the first floor will have to remain in operation as it serves as a fire escape from the small function room at ground floor. A plan to maintain this escape as a safe route must be agreed prior to site start. 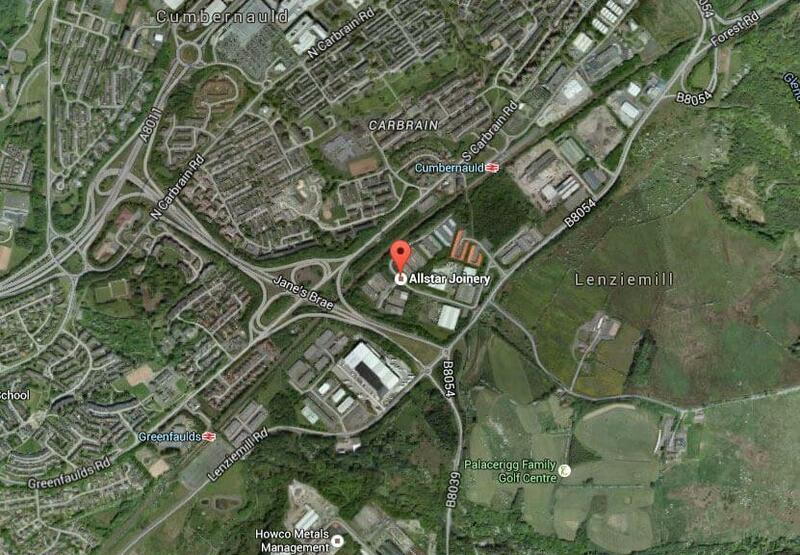 An area of the rear car park to be allocated as the site compound. The Hotel must remain trading on the lower floor and the modern bedroom wing during the works. Allstar Joinery as the main contractor – Fully responsible for the safety of the site and must adhere strictly to good H&S Practice. 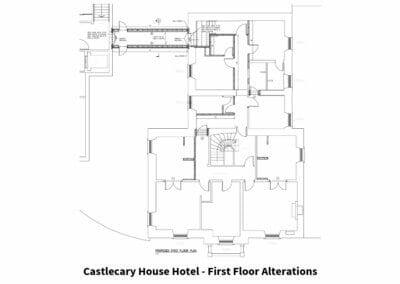 The Castlecary House Hotel to employ a Health and Safety advisor who will assist with any potential site issues and advise the Hotel. Regular site meetings will take place in which site health and safety will be discussed as a main topic. This was a four month programme of works. As always it was a fast moving programme. 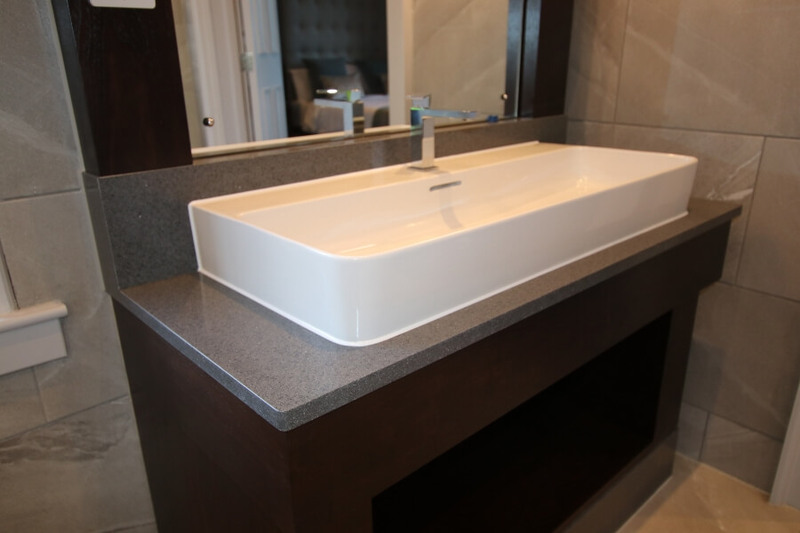 Integrated the Allstar Joinery team and sub contractors in place within a quick response time. We ensured the project was well resourced to meet project needs and budgetary limitations. All orders had to be fast tracked to the site to meet critical delivery dates. With the Allstar Joinery in-house sustainable production facility in Cumbernauld, Glasgow, we were able to facilitate all bespoke manufacture, bespoke commercial joinery and design changes quickly to ensure the project stayed on schedule and within remit. A.1. 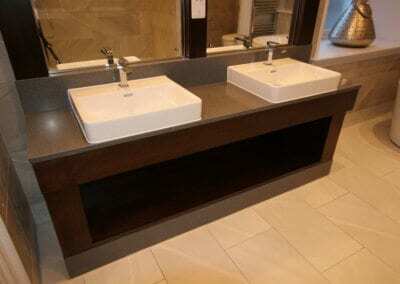 All furniture and fittings. 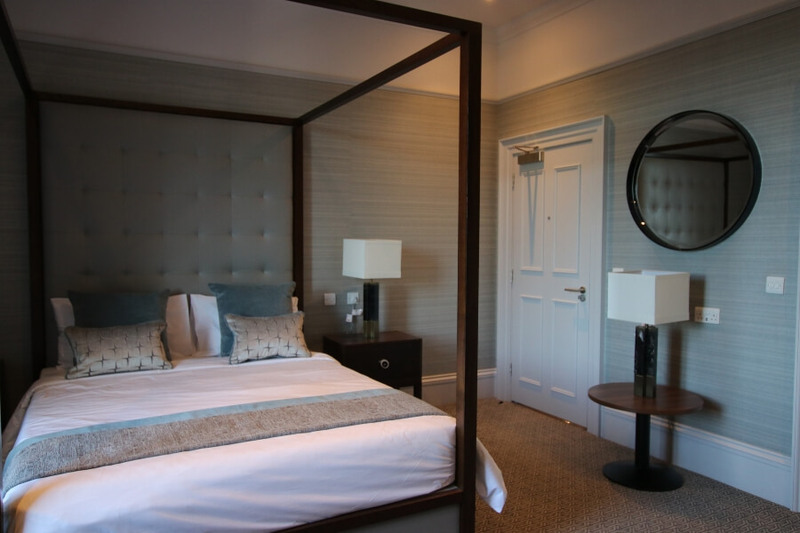 Stripped each of the 5 bedrooms to the rear of all headboards, bed frames, wardrobes, vanity units etc to leave a room empty of all furniture. Lifted and removed from site existing carpet underlay, grippers and threshold strips to the 5 rear bedrooms, the 2 hallways and 2 front bedrooms to expose the bare floor boards. Lifted the vinyl floorcovering and any underlay to the kitchen area and remove from site. Took down and removed from the site all kitchen base and wall units including splashbacks and misc fittings. Striped the floor wall tiles off the bathroom in the rear wing together with any floor underlay to expose the bare floorboards. Stripped tiles in front wing ‘bathroom’ currently covering 1/2 wall. a. 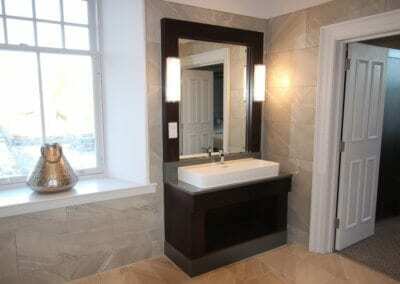 Each of the 5 rear bedroom vanity units. b. The kitchen sink and associated pipework for appliances. c. The wc in the front wing ‘bathroom’. Made safe the gas supply and all pipework to and from the boiler located within the kitchen area and strip everything out and remove from site. Stripped and removed from the site each radiator and associated flow and return pipework to the 5 rear wing bedrooms and bathroom plus the four rooms to the front wing. a. 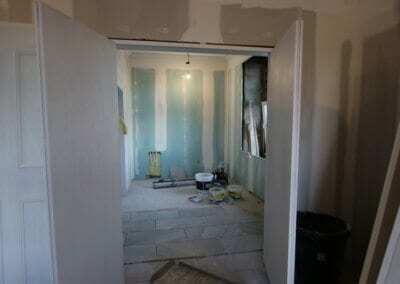 Existing doors frames to the 5 rear bedrooms and bathroom off the hall. b. Two doors and frames to the front wing (kitchen and hall cupboard). c. Two stairwell landing doors and frames. 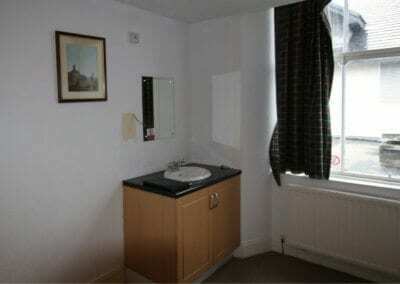 bathroom to the rear. Front wing hallway and hall cupboard. 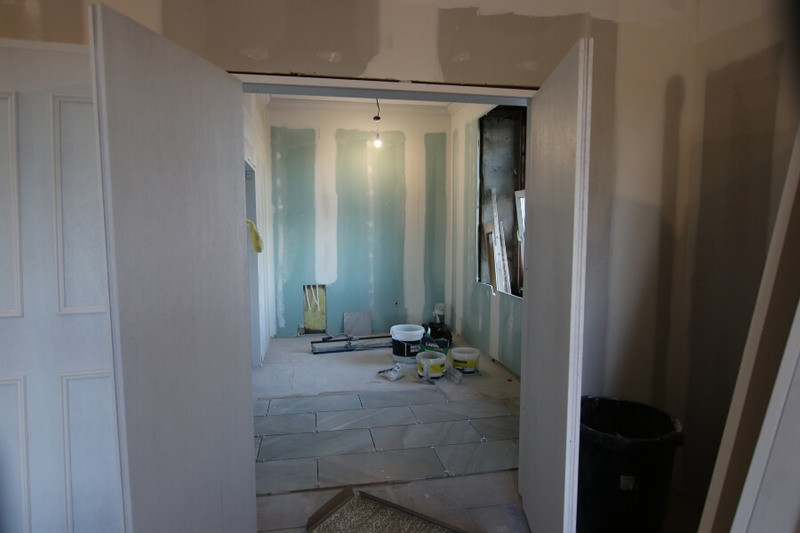 e. Skirting and architrave to the former kitchen and bathroom to the front wing. f. Stripped out windows, cills and all associated timber to former bathroom and kitchen in front wing. g. Stripped out windows, cills and all associated timber to five of the six the rear bedrooms and bathrooms. a. Side wall forming bathroom on the front wing. b. Partition walls forming corridor in the rear wing. c. Lobby and cup`d partitions on the stairwell landing. a. 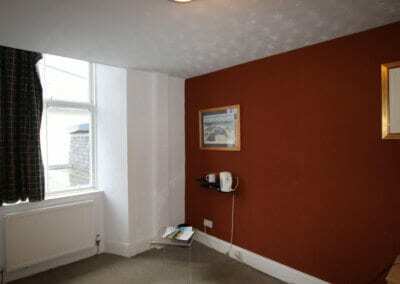 All wall lights to all rooms on the first floor. b. All ceiling downlighters and soffit lights. c. All 13 amp sockets. d. Electricity distribution board (presently in hall cupboard). e. Electrical extract fan to bathroom. f. Emergency exit lights (note remaining system must remain active). g. Smoke detectors (note remaining system must remain active). h. Emergency call points (note remaining system must remain active). i. Sounders remain if practical. 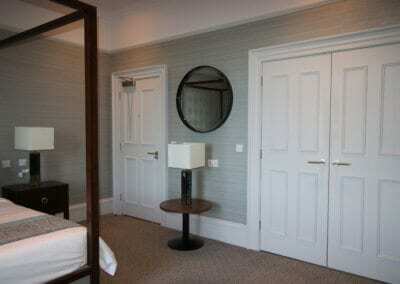 Stripped wallpaper from hotel rooms as specified in plans. Formed two new slappings in partition walls to the two proposed bridal suites. Prop and prepare in accordance with good practice. Formed new slapping through the main structural wall of former cup`d in front bedroom wing. Prop and prepare in accordance with good practice. Formed new slapping through minor structural wall of `Iona` in rear bedroom wing. Prop and prepared in accordance with good practice. Cut holes and form padstones, supplied and fitted two new steel beams to bridge between the Victorian building in bedroom `Muck.` Prop and prepared in accordance with good practice. 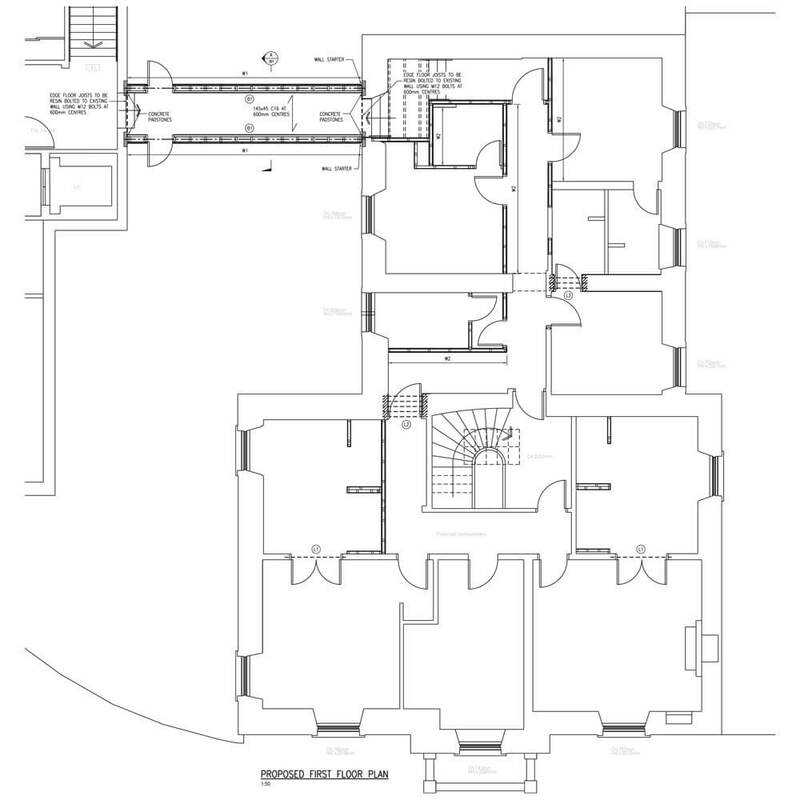 Referred to structural engineers drawing and Architects drawing for positions of new stud partitions forming new hallway walls. Noted Engineers nailing requirements. B.6. Bridge link envelope. Supplied and fitted. Fitted grippers to the perimeter of hallways and all bedrooms terminating at the fire escape doorways and thereafter supply and install heavy duty underlay to these areas. Fitted Client free issue carpet (wide width) to all bedrooms and hallways terminating at the fire escape corridors. Supplied and installed a hardwearing carpet to adhere to the floor of the fire escape corridor from exit door, over bridge, including the landing at the top of the escape stair. Allowing for contrasting aluminium nosings with vinyl inserts to stairs. Fitted grippers to the perimeter to the main stair from the Ground floor and landing and thereafter supply and install heavy duty underlay. Fitted Client free issue carpet (wide width) to the access stair from Ground floor and first floor landing hallway. Supply and fit quality stainless steel threshold strips to the two doorways. Supplied and fitted budget vinyl flooring to the boiler room and access lobby. Vinyl adhered with welded joints. Supplied and installed a lighting LED strip to the perimeter of the existing rooflight which will be concealed behind a timber batten. Strip was being switched from main lights. Was re-wired or adapted where possible emergency lighting from the existing fire alarm panel in the reception at Ground floor serving the first floor. D.7 Emergency call points and sounders. Re-wired or adapted where possible emergency call points and sounders from the existing fire alarm panel in the reception at Ground floor serving the first floor. Commissioning and test certificates were required. Re-wire or adapt where possible smoke/heat detector points from the existing fire alarm panel. Commissioning and test certificates were required. D.9. Temporary lighting and power. Allowed for temporary lighting and temporary power to provide safe illumination and power to building during construction works. Commissioning and test certificates were required for all electrical works. Supplied and installed new sash and case windows. Windows were primed ready for paint finish and incorporated trickle vents. 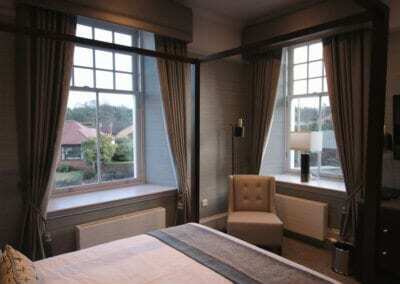 Windows replicated appearance of traditional sliding sash windows and to the standard double swing double glazed. Four existing windows were retained and three were stripped of parts and overhauled. Allowed to plasterboard all window ingoes to the four bedrooms to the rear wing and to two window ingoes to the front wing. Allowed to manufacture and install replacement two piece stepped architraves in softwood to match existing. E.5. Architraves. Supplied and fitted. Manufactured and installed replacement two piece stepped skirting approx. Supplied and installed new 4 panel 1/2 hour fire resisting solid core primed doors on softwood fire door frames, sized to suit wall thickness. a. Tiree, Iona and Eigg main doors, Internal Fire Door. `White Victorian with Non Raised Moulding Prefinished` and fitted with smoke seals. b. Ensuite doors to Tiree, Iona and Eigg. c. Boiler room doors x 3.
d. Fire corridor and escape doors. 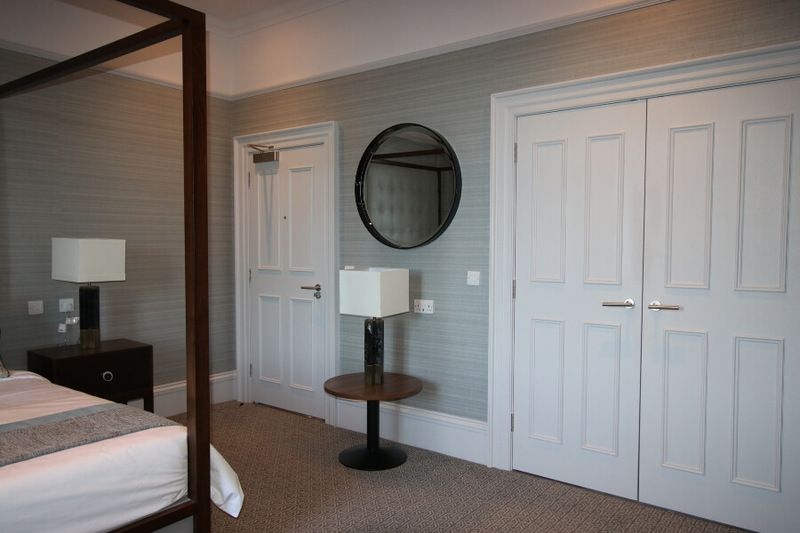 e. Replaced two exiting doors to bridal suites 1 and 2 and fitted with doors similar to `a` above. f. Supply and fitted a pair of Walnut framed safety glass doors. New dropped ceilings provided to rooms where specified. 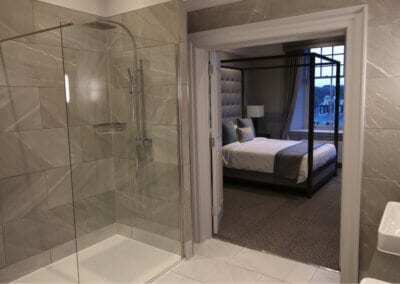 a. Stub partition and backing wall to shower enclosure to en suites. b. 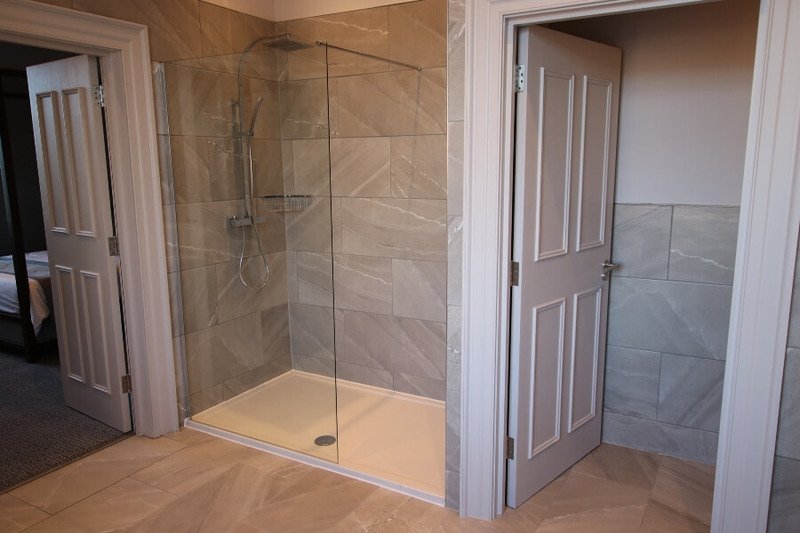 Separating partition to specified en suites between shower and w.c.
c. Enclosing partitions where applicable. Fitted a softwood batten with MDF upstand to the internal perimeter of the existing lass rooflight over the main stairwell. 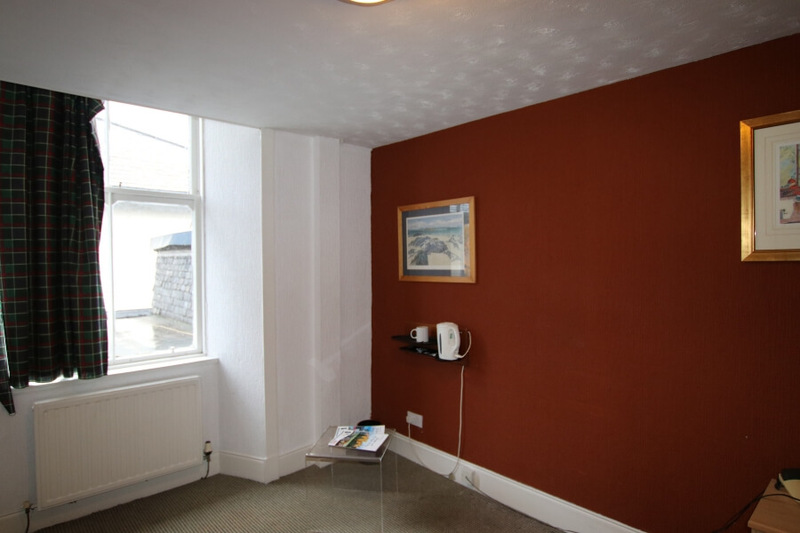 All ceilings and cornices were filled and prepared prior to applying two coats of Dulux emulsion. F.2. 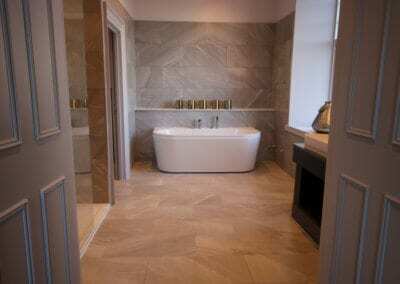 Diamond emulsion to walls in all specified rooms and corridors. Lightly rubbed down, prepared and applied two coats of satin glass paint to specified areas all skirtings, door frames and Architraves. 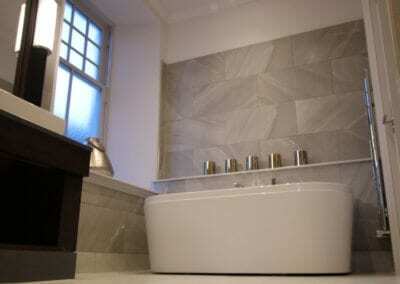 Prepare walls and applied specified wallpaper and paste to the following certain rooms, stair well, side wall areas. Prepared undercoat (new woodwork) prior to applying two coats of quality gloss paint to areas such as specified windows, external doors, frames and cills (to bridge link). 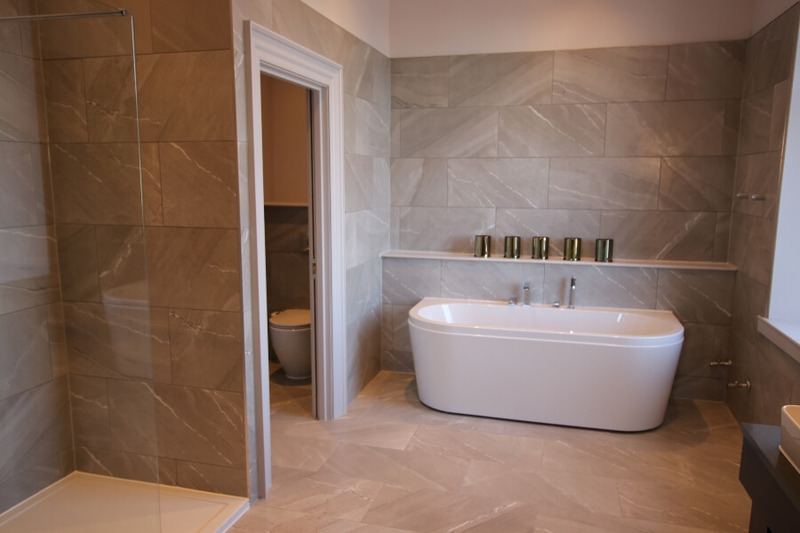 Floor tiles supplied, installed and fitted to tile the following areas wall to wall in en suites where specified and other areas such as splashback in cleaners cupboard. SECTION H. PLUMBER - BOILER AND HEATING. 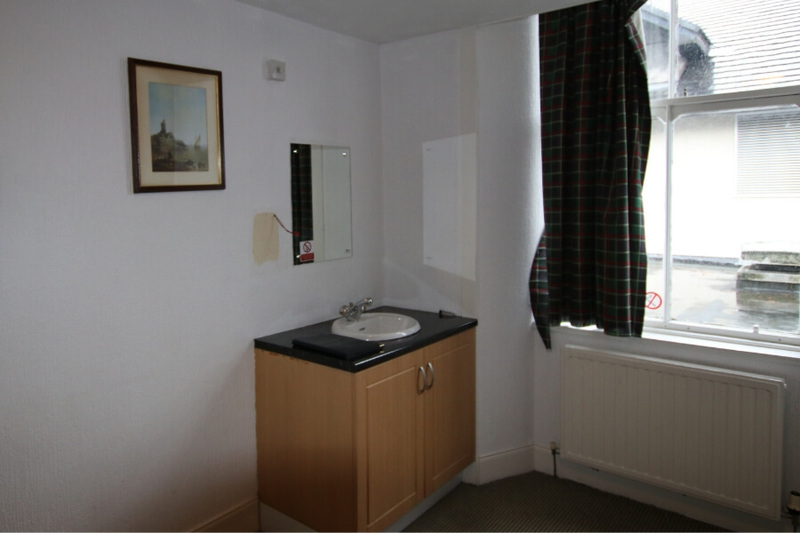 A new boiler was supplied and fitted to provide hot water and heating to the first floor bedrooms only. H.2. Hot and cold water. Provided new hot water pipework from the boiler to all sanitaryware appliances. Permitted to adapted existing cold water pipework to all sanitaryware appliances. Fitted isolation valves prior to all taps and to isolate each bathroom. Supplied and fitted new flow and return pipework to all new radiator positions shown on the plan. Sized radiator suitable for each location and supply and fit flat panel radiators. Provided waste connections to all sanitaryware positions shown on the plan. All connections were made to existing above floor drainage. Allow for air admittance valves to all drain runs. 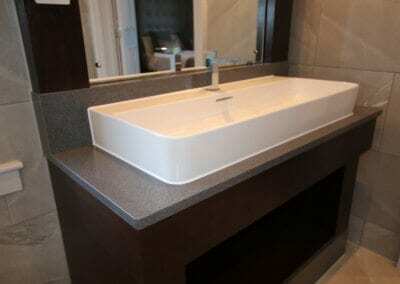 Fitted Client free issue sanitaryware, shower screens, rails and hooks to the en suite bathrooms where specified. 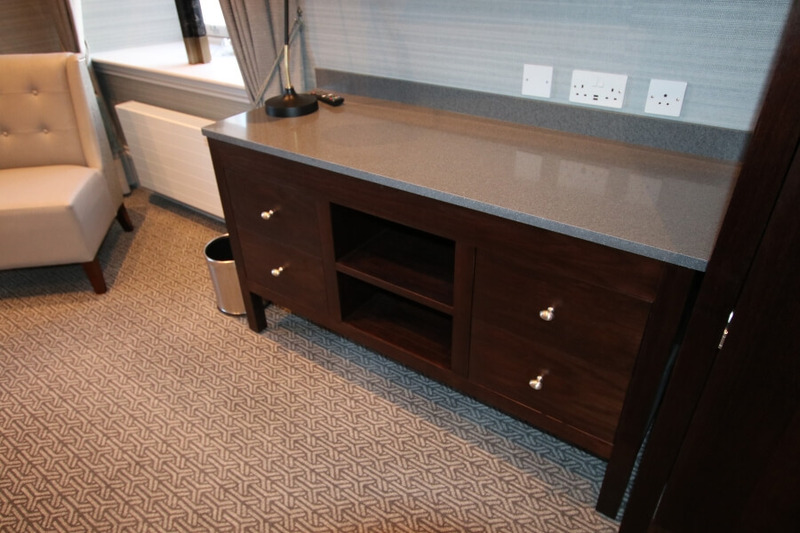 Bespoke commercial joinery manufacture of the following bespoke furniture – Manufactured onsite at Main Contractor HQ only one mile from the project in Cumbernauld. Glasgow. 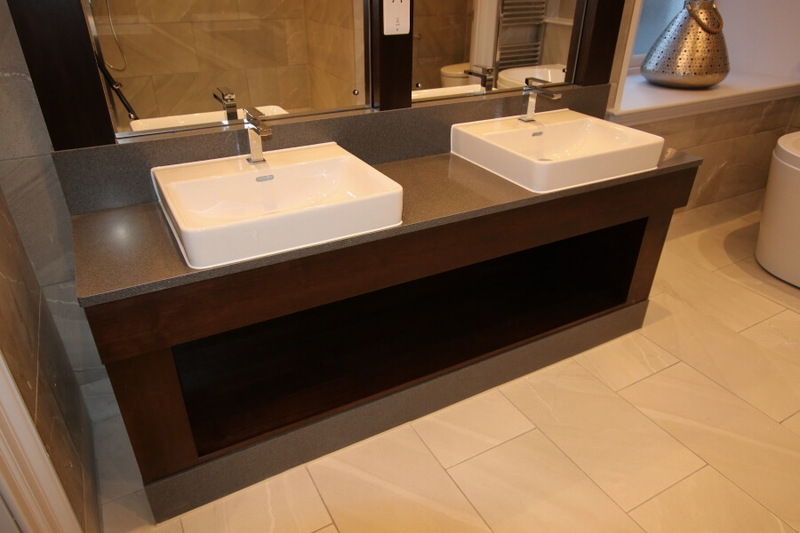 c. Bespoke Bathroom Vanity Units. 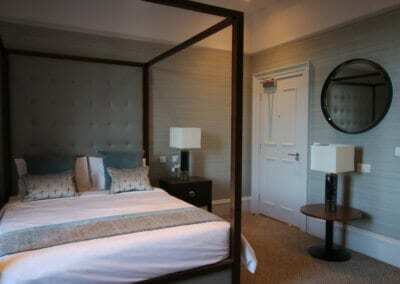 d. Bespoke Lay Downs, Bedroom. 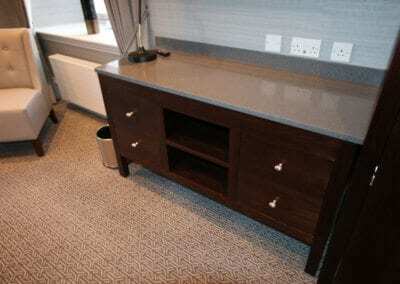 f. Bespoke Wardrobe Dresser Units. SECTION J. PLASTER AND MISCELLANEOUS. A glass door with stainless steel patch hinges was supplied and fitted to the two bridal suite bathroom w.c. cubicles. Glass was safety with a turn indicator lock. Repair work carried out without remit. Supplied and fitted new plaster cornice to areas specified. Allstar Joinery completed the project within timescale and budget. Phase two is now underway to refurbish the downstairs bar and restaurant. 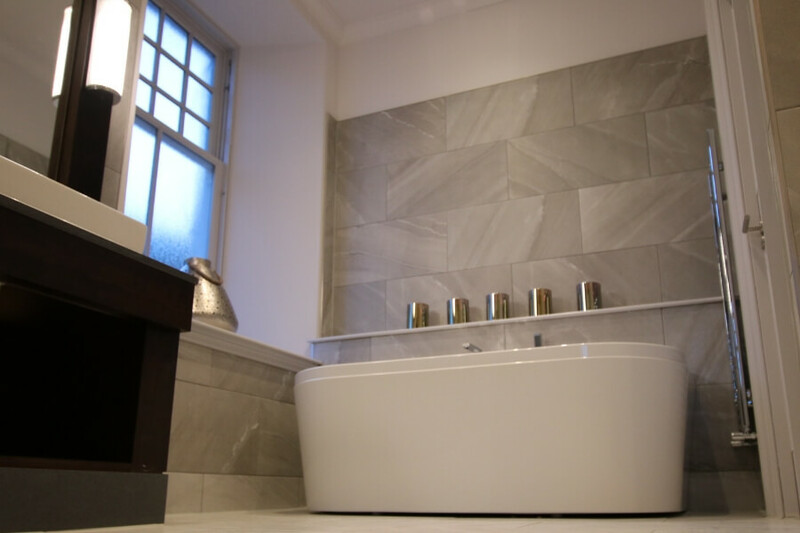 Please view the before and after image gallery and video of phase one of this successful project.